Last Sunday I made mushroom lasagna. It was the first recipe I tackled from my new Cooking Light subscription. It was creamy, it was mushroomy, it was shalloty and garlicky. All flavor elements that I love, love, love. It was a bit labor intensive. A lot of chopping. A lot of bowls and pots and pans. A lot of different steps. Since it's a little involved to make it's best made on a day when you aren't in a rush. So why am I telling you about mushroom lasagna when there is a photo of ice cream above? Because today's post was supposed to be mushroom lasagna. I've been debating in my head all week...Post it? Don't post it ? I don't know. It tasted fine. It was even good--ish. But I didn't love it. And I don't think I'll make it again given the level of effort involved. If I did make it again and I would change some small things, but I don't think they would be enough to turn this dish around into the "love it" category. Though I didn't love it, I've seen it pop up on some other food blogs with a little lovin'. You can check out their experiences and get the recipe from their sites if you want to give this dish a go. And just because, I am sharing a photo. I didn't want them to go to waste after all. After I finally decided what to do about posting the mushroom lasagna, I dug into the photo archives on my computer to see what would fill the blog void. I came up with a few contenders, but finally settled on pumpkin ice cream. I made this ice cream last fall when I was in a pumpkin kind of mood. Going back through my photos (which I didn't love when I took them...which is why this post was so delayed) my pumpkin senses were roused. Pumpkin should not be relegated to only a specific season. You have to give in to the pumpkin cravings when they whisper in your ear. Especially if they tell you to stream in melted chocolate into your pumpkin ice cream to get a pumpkin chip ice cream. I did half the batch plain and half with chocolate bits. 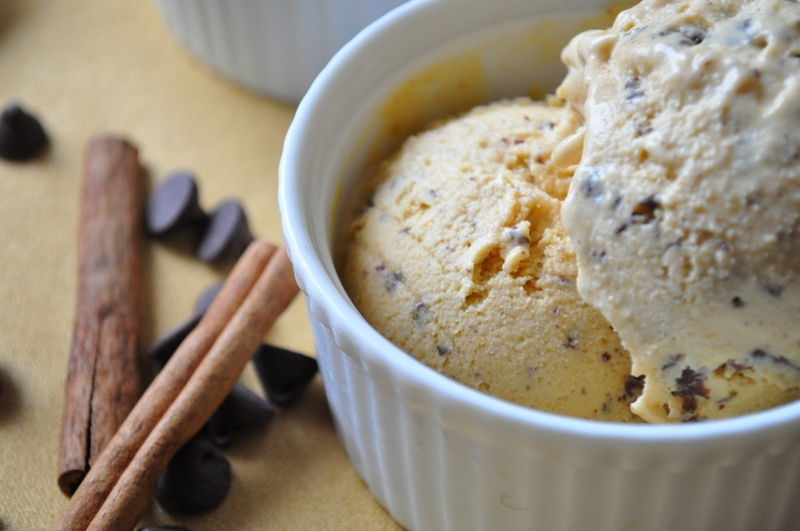 The ice cream is easy to put together and has a lightness about it all the while pumpkin flavor really shines through. The texture is creamy and freezes nicely. It doesn't turn icy or too hard when frozen for an extended period. 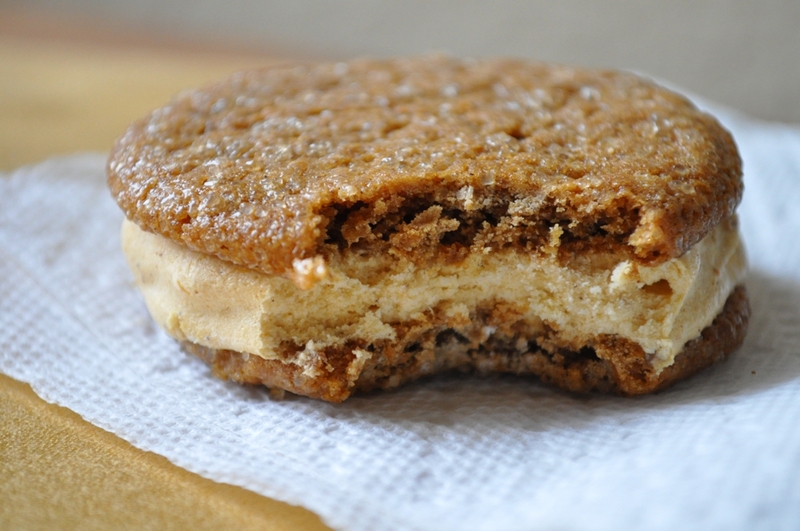 To make your ice cream even more special, sandwich it between 2 homemade ginger snap cookies. 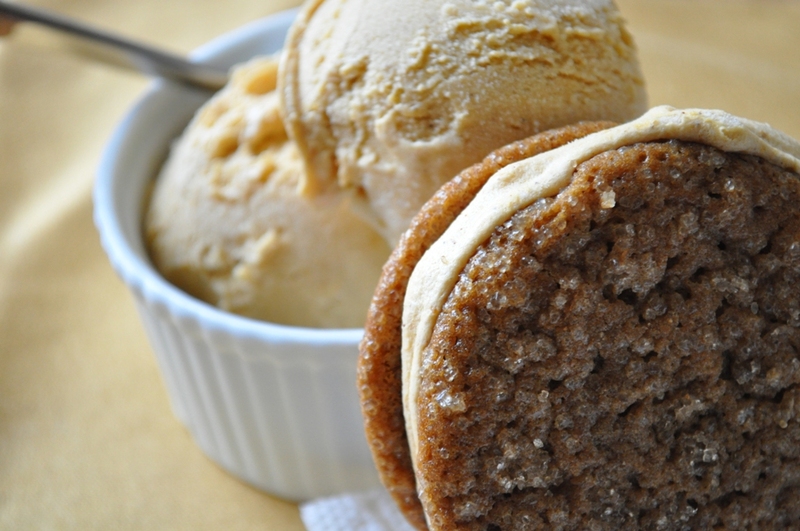 Pumpkin and ginger are great flavor partners. This is my favorite ginger snap recipe. Tracey over Tracey's Culinary Adventures shared some great tips on how to neatly portion out your ice cream for sanwiching. I can't seem to find her specific post that talks about it, but the basic concept is to spread slightly softened ice cream on a baking sheet that will fit in your freezer. Spread it to the thickness you want in your cookie sandwiches and return it to the freezer. Once it's set up, use a cookie cutter to form the ice cream to perfectly match your cookies. It's an especially handy tip if you are using unique shaped cookies. Or you can wing it like I did and just spoon some softened ice cream on your cookie and try to clean up the edges. Is a pumpking craving whispering in your ear? In a small bowl whisk pumpkin puree and vanilla and cover and refrigerate for at least 3 hours or up to 8 hours. In a heavy 2-quart saucepan, combine 1 1/2 cups of the cream and 1/2 cup of the brown sugar and cook over medium heat. Cook until small bubbles form around the edges of the pan, about 5 minutes. Meanwhile, in a bowl, combine the egg yolks, cinnamon, ginger, salt, nutmeg, the remaining 1/2 cup cream and the remaining 1/4 cup brown sugar. Whisk until smooth and the sugar dissolve. Remove the cream mixture from the heat. Gradually whisk about 1/2 cup of the hot cream mixture into the egg mixture until smooth. Pour the egg mixture back into the pan. Cook over medium heat, stirring constantly with a wooden spoon and keeping the custard at a low simmer, until it is thick enough to coat the back of the spoon and leaves a clear trail when a finger is drawn through it about 4 to 6 minutes. Do not allow the custard to boil. Strain the custard through a fine-mesh sieve into a bowl. Place the bowl in a larger bowl partially filled with ice water, stirring occasionally until cool. Whisk the pumpkin mixture into the custard. Cover with plastic wrap, pressing it directly on the surface of the custard to prevent a skin from forming. Refrigerate until chilled, at least 3 hours or overnight. Transfer the custard to an ice cream maker and freeze according to the manufacturer's instructions. Add the bourbon during the last minute of churning. Transfer the ice cream to a freezer-safe container. Cover and freeze until firm, at least 3 hours or up to 3 days, before serving. I do love pumpkin, I think we should eat it year round. The ice cream looks delicious. Great post. I totally do the "post or don't post" fretting too. 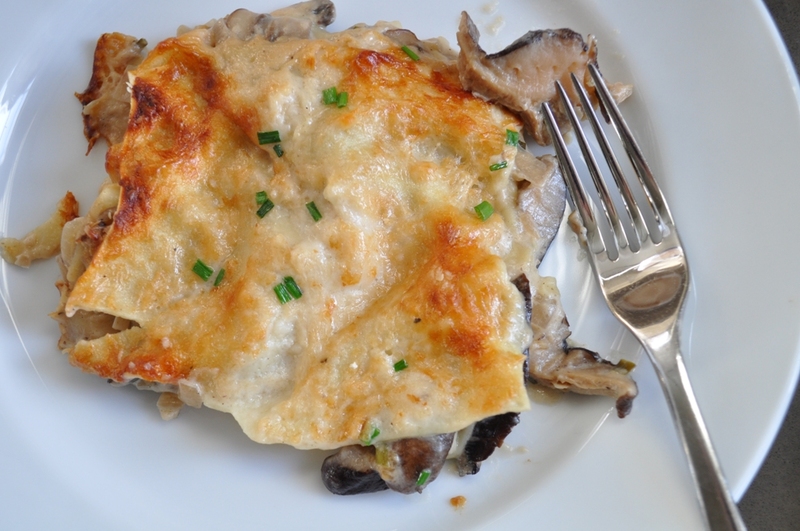 The mushroom lasagna sounds awesome, but I'm usually not a huge fan of recipes with tons of prep either.